On February 29th, 2000 the AQRA inducted 18 members into their hall of fame, along with eight world champion horses from Arizona. This is something that the AQRA board felt was overdue. The Arizona Quarter Racing Assocation would like to honor its members and their great Arizona horses for their accomplishments. The hall of fame was a dream of 2000 AQRA President, James Kelly. It was one of the things initiated by his presidency. The AQRA woud like to express our thanks for his support and hard work in making this a reality. MARCH 23, 2000 was a very important date for nine members of the Arizona Quarter Racing Association. This is the date they were inducted into the "ARIZONA QUARTER HORSE RACING HALL OF FAME". At the historic Allred Brothers Ranch in Mesa, Dale, Harvey, and Jerry Allred, Joe and John Bassett, Roman Figureoa, Mack Hastings, Robert Kieckhefer, and Dale Smith were the first to be induced and were honored by family and friends. The weather could not have been better for the oustide afternoon event. Once you turned off the busy Southern Avenue in downtown Mesa and started doen the long dirt road back to the heart of the Allred Brothers' operation, you could actually imagine you were on a beautiful ranch in the foothills instead of right off the hustle and bustle of the big city streets. As you drove down the road, you could see the training track on the right, and behind one of the three residents on the ranch, was the office nestled in the center of the hay barn, shedrow, and paddocks with mares and babies as far as the eye could see. This was the setting for the afternoon activities, and no amount of fancy words can describe it perfectly. But that's what it was - "PERFECT". CONGRATULATIONS TO THESE,THE FIRST INDUCTEES INTO THE RACING HALL OF FAME AND A HEARTFELT THANKS TO THE ALLRED BROTHERS AND THEIR WIVES FOR BEING A MOST GRACIOUS HOST. was held SUNDAY MAY 7, after the Desert Classic Futurity Finals in Sonoita. It was hosted by the Santa Cruz County Fair and Rodeo Assocation, and AQRA President, James Kelly. Dinner was catered by Cafe Sonoita. The food was authentic Mexian and scrumptious! There was an open bar, and over 200 friends and family of the inductees enjoyed a casual and very enjoyable evening. As the two weeks of racing at Sonoita was once again in the history books, new history was being made as the main hall at the fairgrounds was transformed into a banquet room for the evening's activities. The finalist of the inaugural Desert Classic Futurity were also invited to honor these inductees. As the people arrived it was plain to see that the scene was to be one of remembrance of days gone by by the stores and tales they exchanged. This would be a tribute to these fine men. This would be a night to be honored and remembered by family and friends. It was a wonderful evening of testimony and praise for a few men who have gone down in our history books as the pioneers of our great sport "RACING AMERICAN QUARTER HORSES"
Thanks to the Santa Cruz County Fair and Rodes Association and their director, Pat Kelly, for hosting this night to remember for all who attended. was MAY 21 OF 2000 at Kingman Arizona. Long time resident, JOHN ODLE was honored by his friend and AQRA Past Preseidnt, Tom Bartol. It was between races in th ewinners circle that he had frequented in his long racing career. 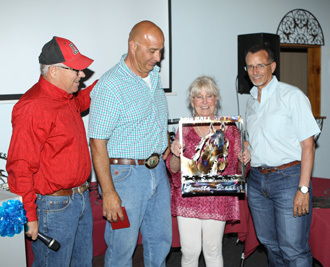 Also on hand to honor the man and occassion was John Ward, AQHA Field Representative, Loretta Brasher, AQRA Executive Director, Jim Bryan, AQRA Vice President, and current President, James Kelly. 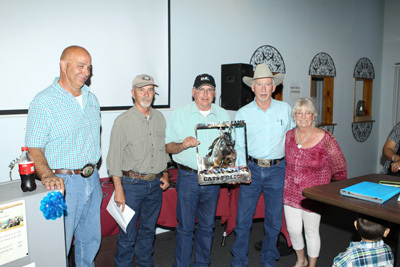 The inductees were honored at the annual awards banquet at Rillito Park. What a great place to honor Arizona Racing history, as this is where Quarter Horse racing began in the state of Arizona. Family and friends were on hand to honor WAYNE BRASHER and 'DINK' PARKER. If you know someone or a great horse worthy of being inducted into the Hall of Fame, submit the information to the AQRA by August of each year.